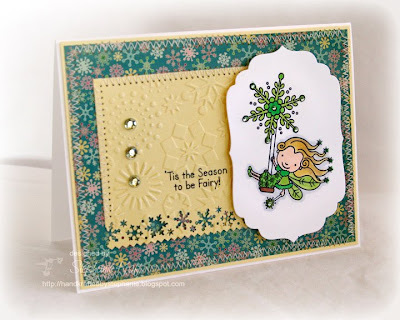 HandKrafted by Stephanie: 'Tis the Season to be Fairy! 'Tis the Season to be Fairy! Hello all! Happy Friday! Sabrina is really into Tinker Bell now! I found some adorable Tinker Bell stamps by EK Success and can't wait to ink them up when they arrive. For now, I thought this Pink Cat Studio digi image of Snowflake Fairy Lily would be fun to use. I used Taylor's sketch, TESC88, and I had intended on playing along with C4C8 to use three geometric shapes, but I got a little sidetracked (unless you call Labels Four a geometric shape). For the purposes of the challenge, let's pretend it's an oval. After all, my first draft was cut out in an oval shape. I had printed my Lily image, colored it, then I added some Stickles to her fairy wings, and I ended up with a big mess. My ink ran and I ended up with a greyish black glittery mess. Accessories: Labels Four Nestabilities (Spellbinders), Snowflake embossing folder (Provo Craft), Snowflake border punch (Martha Stewart), Markers (Copic), Taylor's Tiny Twinkles (Taylored Expressions), Rhinestones (Kaisercraft), Foam tape, Thread, Sewing machine. This is so cute! I love her in green...would of never thought to do that. Ahhh how cute! Love the sweet saying and your colors....just darling! I love this image. Great colours and love the bling.